How Risky Is Gilead Sciences Inc.? Evaluating the big biotech's likelihood of falling further. Gilead Sciences Inc. (NASDAQ:GILD) has fallen about 25% this year, but that doesn't necessarily mean it couldn't fall further; the biotech is still risky. A side effect with one of its current drugs could cause Gilead to have to pull it from the market. A late-stage clinical trial could fail (although Gilead is arguably large enough to require multiple failures to result in a substantial decline in its stock price). The government could put constraints on drug prices. But in addition to those risks, sales of Gilead's hepatitis C drugs have fallen for the last three quarters in a row. And it isn't clear when that's going to stop. Gilead looks really cheap right now based on trailing-12-month metrics. Its price-to-earnings ratio is a shockingly low 7. Looking at valuation based on free cash flow, the biotech looks even better, with a P/FCF ratio of 6.1. Put another way, if Gilead could continue to generate the same cash flow it has over the last 12 months, the company would have cash equal to its current market cap in six years. Investors are clearly betting that won't happen and sales will fall further. Where Gilead's hepatitis C drug sales ultimately land and how quickly the decline occurs will determine whether Gilead is really cheap right now or just a value trap. Unfortunately, figuring out the rate of decline is difficult because it likely depends on the actions of Merck (NYSE:MRK) and AbbVie (NYSE:ABBV), which both have competing hepatitis C regimens. Gilead's drugs are arguably as good or better, allowing the company to keep AbbVie and Merck from taking much of the market share, but Gilead needed to discount the price to retain that market share. If Merck or AbbVie decide they want to get into a price war to try and take market share, it could drive down prices further. Gilead is one of the few biotechs that offers a dividend, which could help prop up the stock price. Investors aren't necessarily buying for the current yield of 2.4%, but it's not hard to see dividend investors stepping in if the share price decreased further and/or Gilead increased its dividend, both of which would increase the yield. With a payout ratio of just 16.3%, the dividend looks safe even if sales decline further. 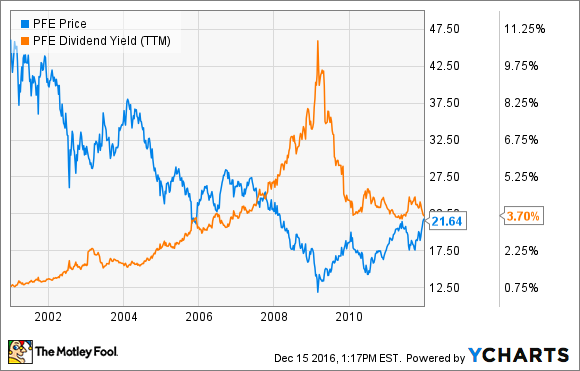 Unfortunately, just because Gilead will look more attractive with a larger dividend yield doesn't mean shares won't fall further. We have a good example of this from a few years ago when Pfizer was on the cusp of losing its top-selling drug Lipitor. Even as the yield topped 5% and larger, shares of the pharma giant continued to decline. It wasn't until Pfizer bought Wyeth in 2009 and cut its dividend in half that the share price started to recover. If Gilead follows the same path as Pfizer, then the real risk for investors is that Gilead's management doesn't do anything to help provide growth through an acquisition. Shares may continue to fall until investors believe revenue will get back to substantial growth. Investors that have confidence that management will eventually use its cash to spur growth externally can purchase now and enjoy the dividend while they wait.